Japan has a long tradition of natural building that I've touched on briefly before, but in today's modern age such practices are now challenging to put into action. The permit process can be arduous (to say the least), and acquiring the straw can be expensive. (Toby and Maiko's free straw from their neighbor across the way is quite the exception to the rule, and a direct benefit of living in Hokkaido. Much of the southern part of Japan is subject to typhoons shortly after the rice harvest. The ensuing strong winds and heavy rains make field drying of the straw nearly impossible.) The straw must then be bailed to spec and stored over the winter - two more pieces of the puzzle that shaped up to become Square One - until the following summer's build dates. Finding an architect familiar with straw bale to help navigate the permit and design process, an experienced natural builder, and a builder willing to work on such a "crazy" idea are others. Yet, there are organizations such as Slow Design Research Group (Japanese website here), the Straw Bale Project, and the Japan Straw Bale Association actively working with consumers to create straw bale interiors as well as structures. Viewed as something of a novelty, the appeal of this sustainable building material is undeniable. The beauty of the finished product is another added benefit that often is the first attractor for interested parties. While our discussion in this section is a bit brief (Toby is giving some thought to puting his reflections into a larger tome of his own and didn't want to give it all away in one fell swoop) it offers a fascinating glimpse of the process. Here we discuss what he sees as the future of straw bale in Japan, and some of the challenges he and Maiko experienced during the construction of Square One. 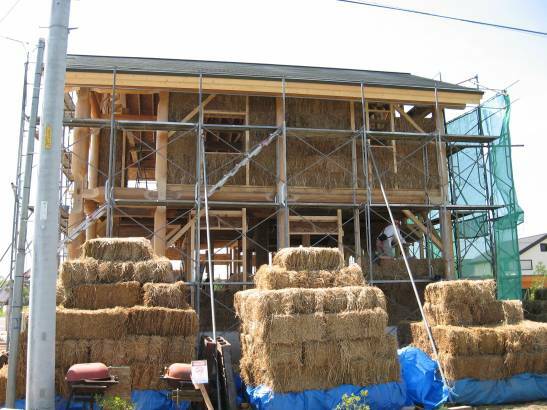 *Thanks to Kyle Holzheuter for his insight on straw bale in Japan. Check out his blog to get an idea of what's happening here with this new (yet old?) concept, and look for a more in-depth piece on it in the near future. PH: What has been the reaction of people as they learn the house is straw bale and the philosophy behind it? TW: Most people are impressed and surprised. At first blush, most of them think it's a way to stay warm in the winter, but it's much more than that which is something we're still educating people about. Other than that, almost everyone is very impressed, because they know how much work it was for us. I believe many, if not most, straw bale homes in America are even more hands-on by the owners. For six months, Maiko and I didn't have any holidays, often worked on the house before and after our main work for the week, and then late into the evening on plans and discussions. I believe most projects like this in North America have at least one person on site at all times. However, I think anything even close to what we were doing is extremely unusual in Japan. it was a very complicated route we chose to get to Square One, but I believe it was the best for our situation. PH: Were there any challenges or benefits you found that might be peculiar to Japan? I'm thinking here of the post where you mention the saying, "The nail that sticks out gets pounded back in." in the days of working out the permit process. It struck me that there may have been many moments along the way like this - both good and bad - and that it might be interesting for someone thinking of embarking on a similar project to hear about that in a little more detail. TW: Yes, we had challenges and benefits peculiar to Japan. I think this is very interesting indeed, and was constantly reminded throughout the whole process how "interesting" it was. One thing I will tell you was that it was particularly challenging to have my main builders be Japanese and my natural builder be a foreigner whose years of straw bale experience were in America. We were often stuck in the middle of these two building cultures. PH: Why do you think straw bale has not caught on more in Japan. Rice straw is everywhere, and it seems like a great choice that would be sustainable. TW: It's going to take a long time for this to go mainstream in Japan. It seems that only recently has the "My Bag" concept - taking a reusable shopping bag to the store each time - taken hold, and that is super easy. House building is a big industry in Japan, especially up here in Hokkaido. And Japanese culture is more about hiring people to do things for you rather than doing it yourself. But there will always be people who choose to go against the grain, and with knowledge and awareness, I believe straw bale will become more popular over time. Read the first part of my discussion with Toby about Square One, and take a look at his blog to get the latest on his straw bale adventures in Hokkaido. Tomorrow I'll share the third part of the interview, The View from Square One, where Toby reflects on the project as a whole and the community that formed around it. Do you know of any Japanese farms who are able to supply wheat straw bales suitable for people wanting to try out Joel Karsten's straw bale Gardening method in Japan? Ideally organic, but if not, any? Thanks! Good question. I know of one grower/producer of organic flours at the Earth Day Market in Tokyo. He may have some to share. Rice straw might be a good swap, though, and easier to find. What do you think?